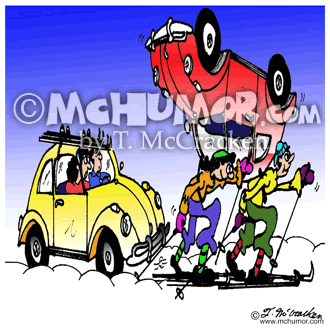 Skiing Cartoon 4685: A VW bug with skies on its roof and behind it two cross country skiers carrying a VW bug on their backs. 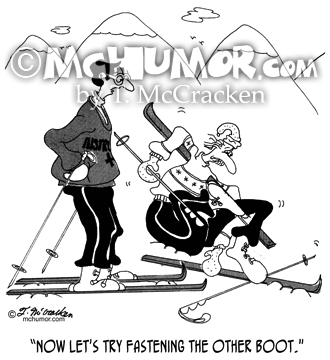 Skiing Cartoon 5122: A ski instructor says to a skier who’s a tangle of arms and legs, "Now let's try fastening the other boot." 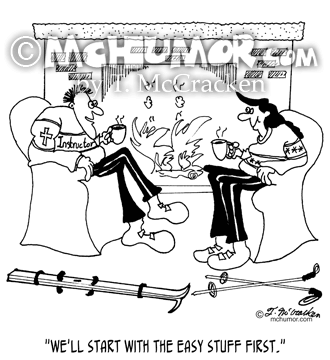 Skiing Cartoon 5700: A ski instructor sitting in front of a fireplace and drinking says to a student, "We'll start with the easy stuff first." 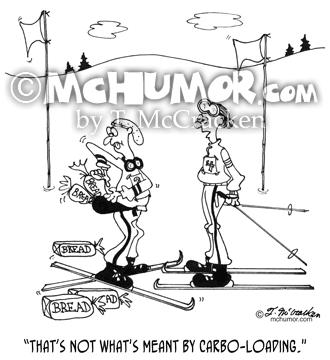 Skiing Cartoon 4730: As skier stuffs loaves of bread into his fanny backpack another says, "That’s not what's meant by carbo-loading." 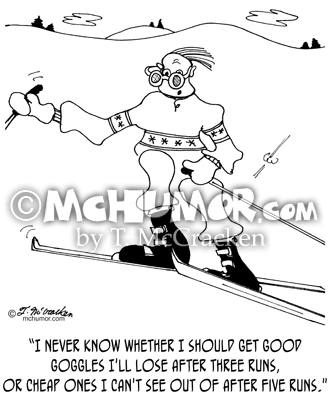 Skiing Cartoon 4732: A skier with scratched goggles dangling from his face says, "I never know whether I should get good goggles I'll lose after three runs, or cheap ones I can't see out of after five runs." 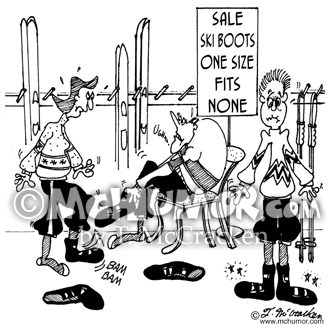 Skiing Cartoon 4711: People struggling to put on boots in a store with advertising, “Ski Boots, One Size, Fits None." 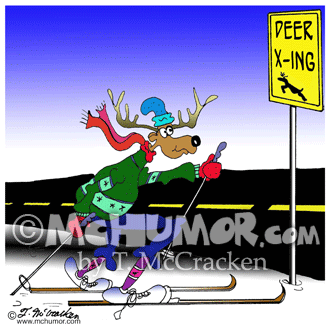 Skiing Cartoon 4684: At the bottom of a run a skier saying to another who's just had a really bad fall and looks pooped another skier says, "What luck, Jane. 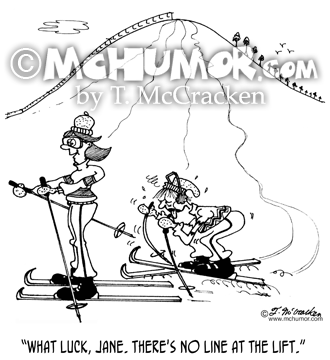 There's no line at the lift." 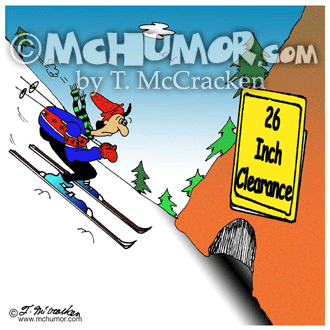 Skiing Cartoon 5702: A tall skier zipping towards a tunnel with a sign, "26 Inch Clearance." 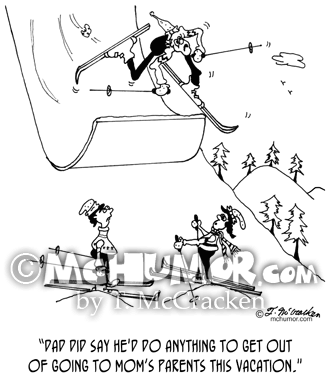 Skiing Cartoon 5697: A kid to another watching ski jumper overhead, "Dad did say he'd do anything to get out of going to Mom’s parent’s this vacation."